Our bed side ultrasound scanner is used as an adjunct to our assessment. It aids our diagnosis when used in conjunction with subjective questions and objective tests. Accurate diagnosis means treatments are appropriate and therefore effective. Scanning can also be used to give feedback to the patient when exercising. This ensures that the exercises are accurate and therefore effective. This is particularly useful with core stability exercises such as Transverse Abdominals and pelvic floor. 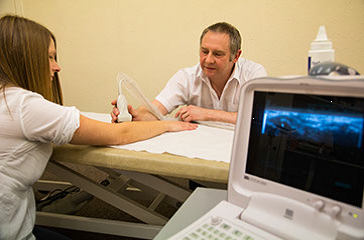 Chris using the ultrasound scanner as part of his assessment of tennis elbow.